Collation: 208 pp. 70.1-70.138. 17.4 x 10.8 cm., all edges trimmed. Printed on white wover paper. Contents: pp. [1,2] blank. p.  TWO | NOVELS | BY |GUILLAUME | APOLLINAIRE. p.  This volume contains two novels | by Guillaume Apollinaire, translated | from the French, and previously | published by The Olympia Press | in two distinct volumes. They | are: THE DEBAUCHED HOS- |PODAR (p.7) and MEMOIRS | OF A YOUNG RAKEHELL |(p. 125). 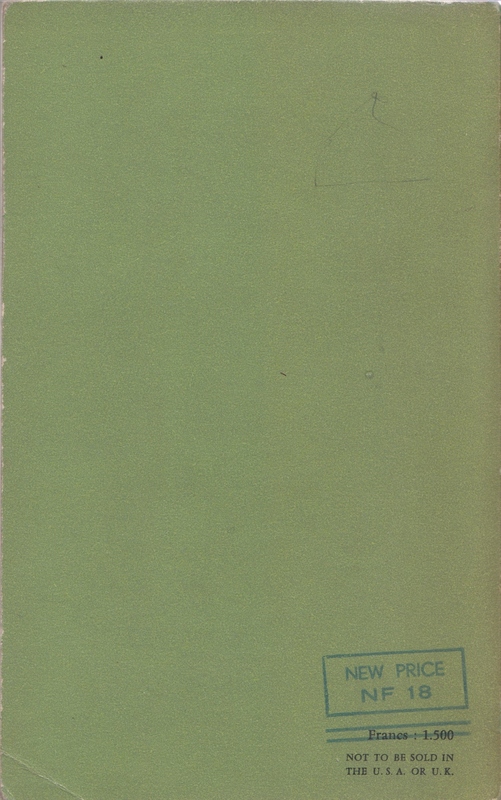 | PRINTED IN FRANCE | [rule] | Copyright by The Olympia Press, Paris, 1959. p.  title, as in * above, reverse blank. p. 7-121, text. p.  blank. p.  title, as in ** above, reverse blank. pp. 125-204, text. p.  Printed May 1959 by S.I.P., Montreuil, France | Dépôt légal : 2e trimestre 1959. pp. [206-208] blank. Binding: Olive-green wrappers, printed in black, and trimmed flush with body of the book. 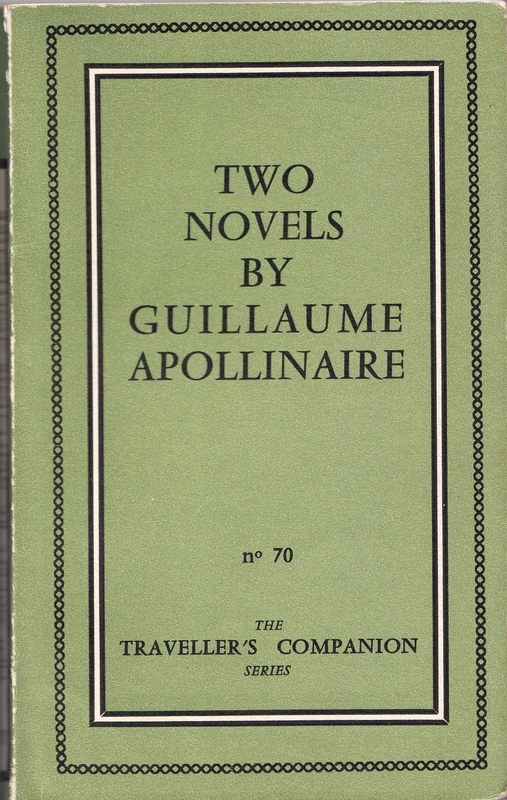 [Front cover; within a frame of two borders, the outer consisting of fine linked chain of type device in black, and the inner a thin band of white edged in black:] TWO | NOVELS | BY | GUILLAUME | APOLLINAIRE |no 70 | THE | TRAVELLER’S COMPANION | SERIES. [Spine; within a white, black-edged panel, the series no. in horizontal digits at bottom and title lettered vertically up spine:] 70 [-] TWO NOVELS BY GUILLAUME APOLLINAIRE. [Back cover, at bottom right-hand corner:] Francs : 1.500. Notes: Reprints of translations published originally by the Olympia Press in separate volumes in 1953 (1.6 and 1.4, respectively). Collation: 192 pp. 70.1-70.128. 17.4 x 10.8 cm., all edges trimmed. Printed on white wove paper.Contents: pp. [1,2] blank. p.  TWO | NOVELS | BY |GUILLAUME | APOLLINAIRE. p.  This volume contains two novels | by Guillaume Apollinaire, translat-| ed from the French, and previously | published by The Olympia Press | in two distinct volumes. They are: | THE DEBAUCHED HOSPO-| DAR (p.7) and MEMOIRS OF | A YOUNG RAKEHELL (p. 115). | PRINTED IN FRANCE | [rule] | COPYRIGHT © BY THE OLYMPIA PRESS, PARIS, 1959, 1962. p.  title, as in * above, reverse blank. p. 7-114, text. p.  title, as in ** above, reverse blank. pp. 117-, text. p.  Printed in October 1962 by S.I.P., Montreuil, France | Dépôt légal : 2e trimestre 1962. p.  blank. Binding: Olive-green wrappers, printed in black, and trimmed flush with body of the book. 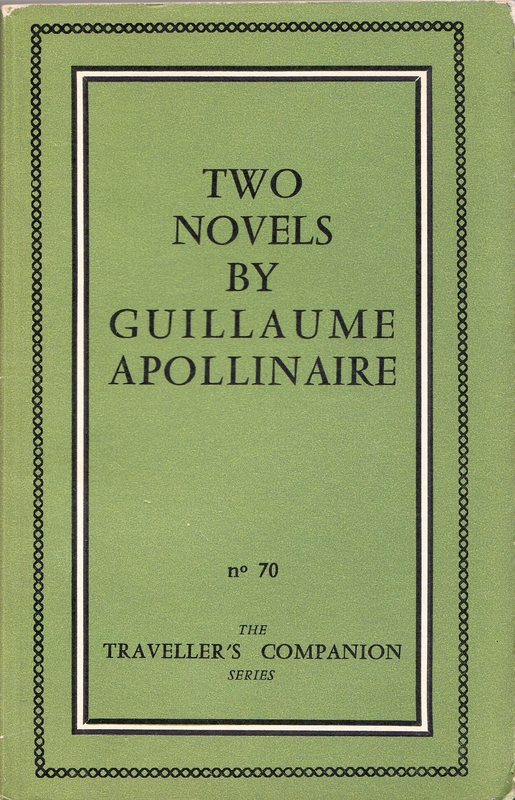 [Front cover; within a frame of two borders, the outer consisting of fine linked chain of type device in black, and the inner a thin band of white edged in black:] TWO | NOVELS | BY | GUILLAUME | APOLLINAIRE |no 70 | THE | TRAVELLER’S COMPANION | SERIES. [Spine; within a white, black-edged panel, the series no. in horizontal digits at bottom and title lettered vertically up spine:] 70 [-] TWO NOVELS BY GUILLAUME APOLLINAIRE. [Back cover, at bottom right-hand corner:] 18 N.F. | NOT TO BE SOLD | IN U.S.A. & U.K..
3 copies: One Copy Very Good,+ One copy Very Good, One copy poor, full description of condition and extra images on request. Collation: 456 pp. Perfect bound. -288, 294. 17.4 x 11.0 cm., all edges trimmed. Printed on white wove paper. Contents: pp. [1-2] blank. p.  A TRILOGY : | PAULA |THE | PIQUÔSE | DUKE | COSIMO | THE | DOUBLE-BELLIED | COMPANION. p.  blank. p.  title, as * above, reverse blank. pp. 7-177, text of Paula the Piquôse. p.  blank. p.  title, as ** above. p.  blank. pp. 3-131, text of Duke Cosimo. p.  blank. p.  title, as *** above. p.  blank. p.  PART ONE | A CRUMBLING FACADE. p.  blank. pp. 5-66, part one of The Double-Bellied Companion. p.  PART TWO | I HAVE COME BACK. p.  blank. pp. 69-143, part two of The Double-Bellied Companion. p.  [rule] | Copyright by The Olympia Press Paris 59 | Printed in France by Imp. G. Frère-Paris Dépôt légal no 26336 – 2e trimestre 1959. pp. [145,6] blank. Binding: Olive-green wrappers, printed in black, and trimmed flush with body of the book. 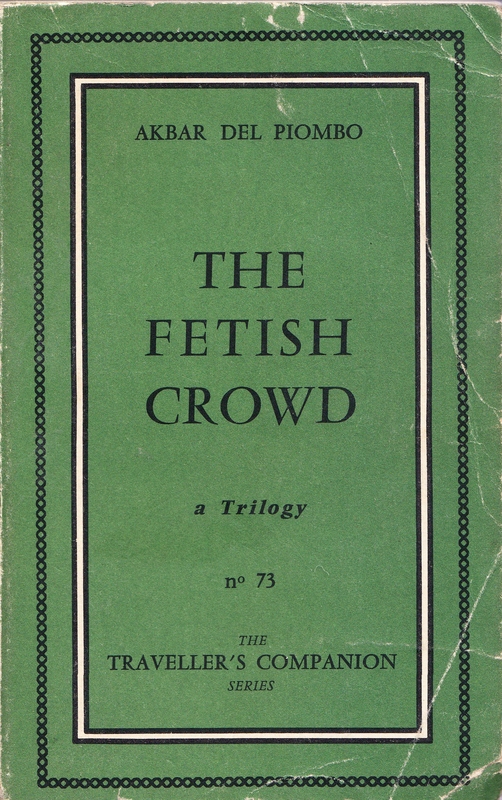 [Front cover; within a frame of two borders, the outer consisting of fine linked chain of type device in black, and the inner a thin band of white edged in black:] AKBAR DEL PIOMBO | THE | FETISH | CROWD | a Trilogy | no 73 | THE | TRAVELLER’S COMPANION |SERIES. [Spine; within a white, black-edged panel, the series no. in horizontal digits at bottom and title lettered vertically up spine:] 73 [-] THE FETISH CROWD. [Back cover, at bottom right-hand corner:] Francs 2.400 | NOT TO BE SOLD | IN U.S.A. & U.K.. 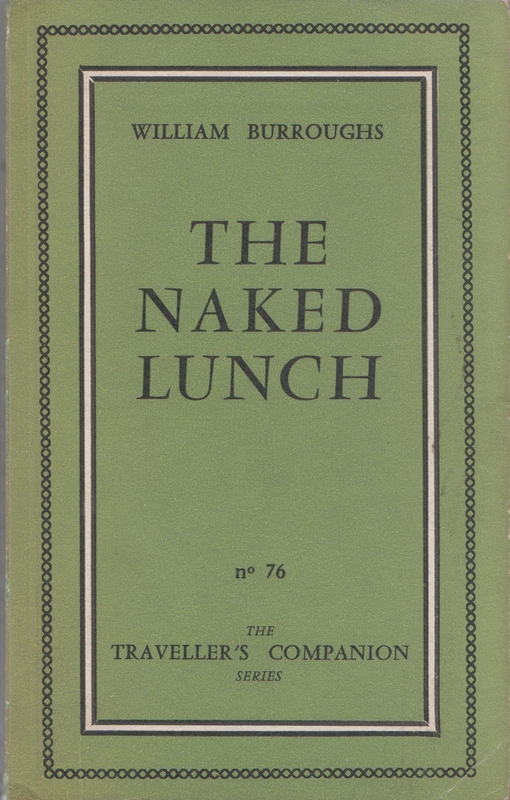 Issued in a mustard dustjacket, with an semi-abstract design of people in white silhouette standing on an uneven white base spreading round the upper half of the front and back panels, and spine. Superimposed over this motif on the front panel is a drawing of a mustached, bemedalled and monocled military figure with a cloak hanging off the left shoulder. To the right of this figure, and occupying a break in the silhouetted figures is: AKBAR DEL PIOMBO, lettered in black, each word enclosed within its own uneven white block. Below the uneven white base supporting the silhouettes is the following, in ornate, uneven black letters: THE FETISH | CROWD. Spine lettered in black; from top to bottom: [in horizontal caps:] AKBAR | DEL | PIOMBO. [In vertical caps reading up the spine:] THE FETISH CROWD. [In horizontal caps:] THE | OLYMPIA PRESS. The back panel has, centered at its foot in black caps: OLYMPIA PRESS. The front inside flap carries a short list of books published by The Olympia Press, a warning that none of the books may be sent to the United States or Great Britain and the address of the company. The back inside flat is blank. Notes: As must be evident, this is a re-issue of three of Akbar del Piombo’s earlier novels respectively, Who Pushed Paula, Cosimo‘s Wife and The Traveller‘s Companion under new titles, and retaining separate paginations. These paginations are quite different from the original printings, and whether they are taken from later reprints unknown to the compiler or original to this one-volume collection is not known. Collation: 456 pp. -288, 294. 17.4 x 11.3 cm., all edges trimmed. Printed on white wove paper. Contents: pp. [1-2] blank. p.  title, as in * above. p.  OTHER WORKS BY WILLIAM BURROUGHS | PUBLISHED BY OLYMPIA PRESS: | THE SOFT MACHINE | THE TICKET THAT EXPLODED. p.  THE FETISH CROWD | A TRILOGY : | PAULA | THE | PIQUÔSE | DUKE | COSIMO | THE | DOUBLE-BELLIED | COMPANION. p.  blank. pp. 7-177, text of Paula the Piquôse. p.  blank. p.  title, as in ** above. p.  blank. pp. 3-131, text of Duke Cosimo. p.  blank. p.  title, as in *** above. p.  blank. p.  PART ONE | A CRUMBLING FACADE. p.  blank. pp. 5-66, part one of The Double-Bellied Companion. p.  PART TWO | I HAVE COME BACK. p.  blank. pp. 69-143, part two of The Double-Bellied Companion. p. , Printed by Imprimerie Croutzet, Paris, June 1965. | Dépôt légal 2e trimestre 1959 (No 26336), 2e trimestre 1965. pp. [145,6] blank Binding: Olive-green wrappers, printed in black, and trimmed flush with body of the book. 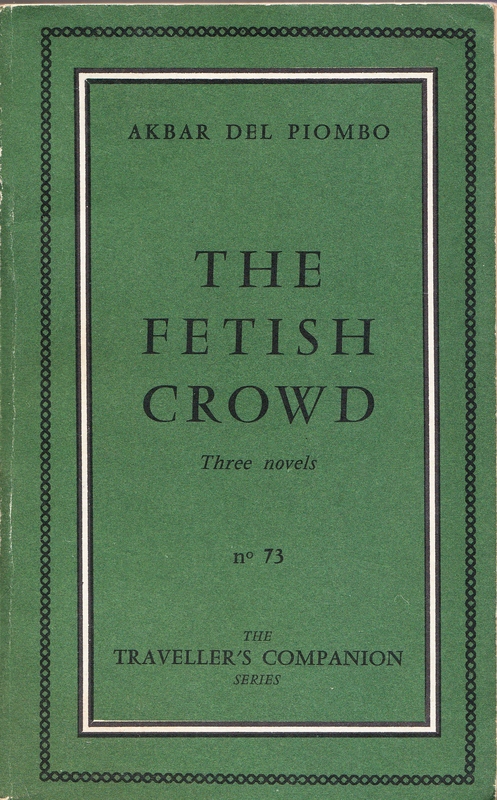 [Front cover; within a frame of two borders, the outer consisting of fine linked chain of type device in black, and the inner a thin band of white edged in black:] AKBAR DEL PIOMBO | THE | FETISH | CROWD | Three novels | no 73 | THE | TRAVELLER’S COMPANION | SERIES. [Spine; within a white, black-edged panel, the series no. in horizontal digits at bottom and title lettered vertically up spine:] 73 [-] THE FETISH CROWD. [Back cover, at bottom right-hand corner:] Francs : 30. Notes: (1) The unfortunate reference to William Burroughs on p.  in the volume’s first section actually a printer’s or editor’s blunder has led to speculation that Burroughs and Akbar del Piombo are one and the same, a notion that reportedly failed to amuse either men. (2) A copy of this book in Mr William Ashley’s collection, in an altered state, has an adhesive sticker on the back wrapper with a change of price indicated thus: OLYMPIA PRESS | [rule] | 18 FRANCS. One Very Good copy . Detailed description of condition and extra images on request. [Within a green border of type ornament:] WU WU MENG |HOUSES | OF | JOY | THE TRAVEL-LER’S COMPANION |SERIES | published by | THE OLYMPIA PRESS | [border broken, but address missing] Collation: 240 pp. HOUSES OF JOY  – HOUSES OF JOY 158. 17.5 x 10.8 cm., all edges trimmed. Printed on white wove paper. Contents: pp. [1,2] blank. p.  HOUSES | OF | JOY, reverse blank. p.  title, as above. p.  Printed in France |by S.I.P., Montreuil, December 1958 | Dépôt légal : 4e trimestre 1958. | New printing by Imprimerie Grou-Radenez, | July 1965. | Copyright © by The Olympia Press, 1958, 1965. p. 7, Introductory Note, reverse blank. pp. 9-238, text. p. [239-240] blank. Binding: Olive-green wrappers, printed in black, and trimmed flush with body of the book. 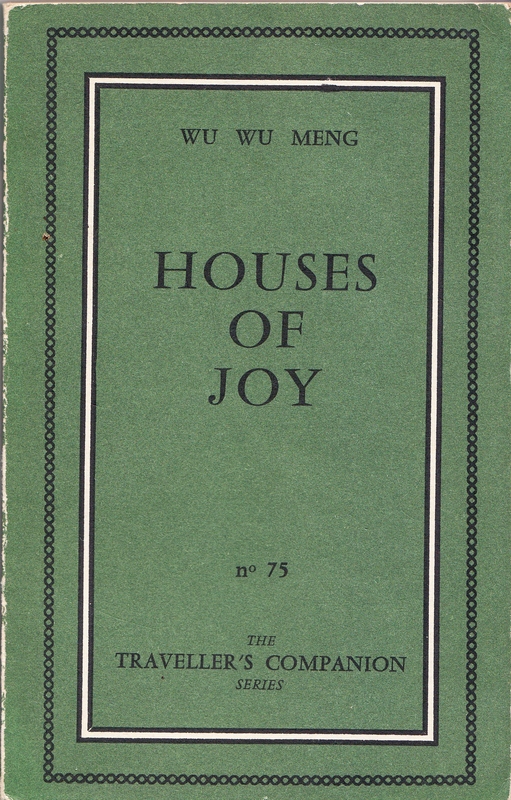 [Front cover; within a frame of two borders, the outer consisting of fine linked chain of type device in black, and the inner a thin band of white edged in black:] WU WU MENG | HOUSES | OF | JOY | no 75 | THE |TRAVELLER’S COMPANION | SERIES. [Spine; within a white, black-edged panel, the series no. in horizontal digits at bottom and title lettered vertically up spine:] 75 [-] HOUSES OF JOY. [Back cover, at bottom right-hand corner:] Francs: 18. One Copy Very Good, with OP 9 Francs Sticker full description of condition and extra images on request. Collation: 304 pp. 77.1-77.198. 17.5 x 11.0 cm., all edges trimmed. Printed on white wove paper. Contents: pp. [1,2] blank. p.  THE | BLACK | BOOK. p. PRINTED IN FRANCE | [rule] | First published by The Obelisk Press, Paris, 1938. 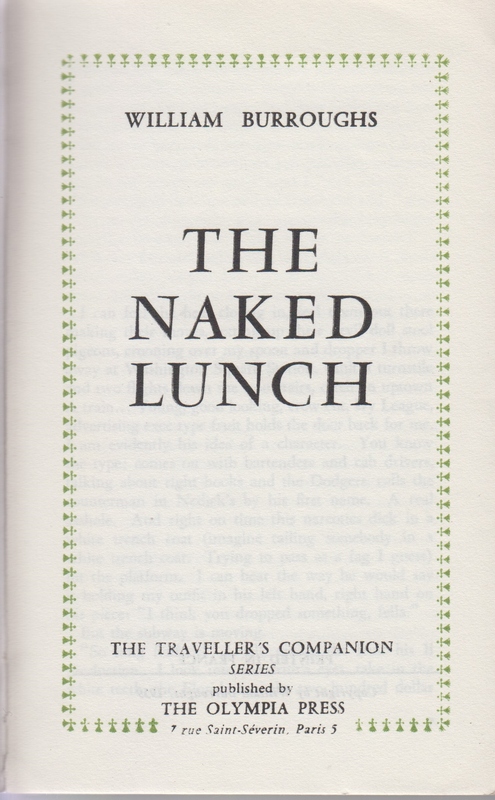 | Copyright 1938 and 1959 by Lawrence Durrell. p.  title, as above. p.  Mos gus yod na | Khyl so od tung.ŗ | (Tibetan Proverb.) | Where there is veneration, | Even a dog’s tooth emits light. p. 7-9, Introduction by the author. p.  blank. p.  BOOK ONE, reverse blank. pp. 13-123, text of Book One. p.  blank. p.  BOOK TWO, reverse blank. pp. 127-215, text of Book Two. p.  blank. p.  BOOK THREE, reverse blank. pp. 219-301, text of Book Three. p.  blank. p.  Printed by S.I.P., Montreuil, France, in July 1959 | Dépôt légal : 3e trimestre 1959. p.  blank. Binding: Olive-green wrappers, printed in black, and trimmed flush with body of the book. 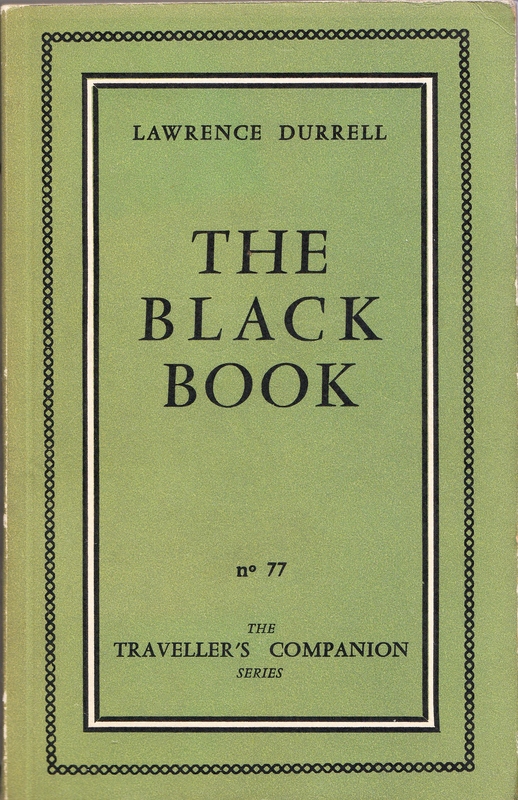 [Front cover; within a frame of two borders, the outer consisting of fine linked chain of type device in black, and the inner a thin band of white edged in black:] LAWRENCE DURRELL | THE | BLACK | BOOK | no 77 THE | TRAVELLERS COMPANION | SERIES. [Spine; within a white, black-edged panel, the series no. in horizontal digits at bottom and title lettered vertically up spine:] 77 [-] THE BLACK BOOK. [Back cover, at bottom right-hand corner:] Francs : 1.500 | NOT TO BE SOLD IN | THE U.S.A. OR U.K.. 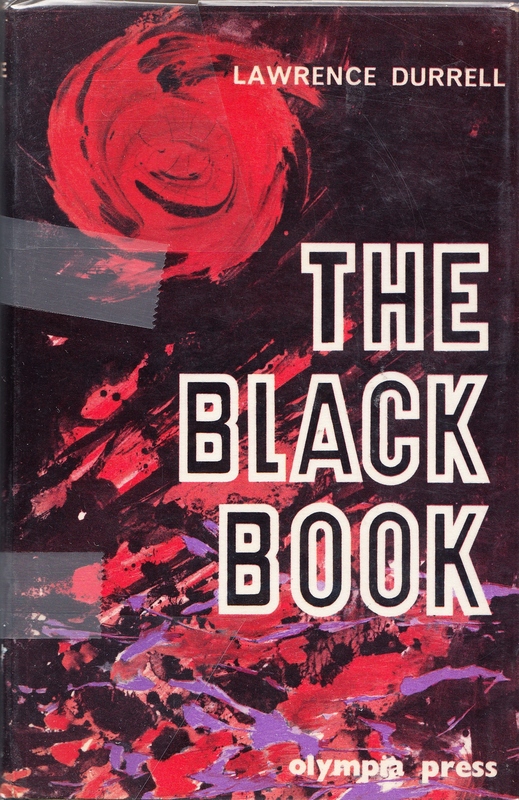 Issued in a black dustjacket, with an abstract painting on the front in red and purple. [Frontover; in white caps:] LAWRENCE DURRELL [in black caps outlined in white:] THE | BLACK | BOOK [in white caps:] OLYMPIA PRESS. [Spine, all in white caps; horizontally at bottom:] THE | OLYMPIA | PRESS [vertically:] THE BLACK BOOK [horizontally:] LAWRENCE |DURRELL. Inside flaps of dustjacket carry a B&W photograph of Durrell, followed by a brief history of the book and some critical comments by T. S. Eliot, Cyril Connolly and Henry Miller, and a short catalogue of other Olympia Press titles. Notes: First published at Paris in 1938 by The Obelisk Press, as part of the Seurat Series. 3 Copies one in DW, Very Good . 2 Printed covers Very Good. Extra Images and full description of condition on request. [Within a black border of type ornament:] JEAN GENET | THE | THIEFS | JOURNAL | THE TRAVELLER’S COMPANION | SERIES | published by | THE OLYMPIA PRESS | [breaking the border:] 7 rue Saint-Séverin, Paris 5 Collation: 296 pp. -188; 194. 17.4 x 10.9 cm., all edges trimmed. Printed on white wove paper. Contents: pp. [1,2] blank. p.  THE | THIEFS | JOURNAL. p.  blank. p.  title, as above. p.  Published in agreement with the Librairie Gallimard. | [short history of book; see notes to 7.78.1 for text] | [rule] | Copyright 1954 by B. Frechtman | and The Olympia Press, Paris. p. [7-8], Foreword by Jean-Paul Sartre. p. -291, text. p.  blank. p.  Printed July 1959 by Imp. Moderne du Lion | 75, Rue des Plantes – Paris 14e |Dépôt Légal 2e trimestre 1954 et 3e trimestre 1959. pp. [294-296], blank. Binding: Olive-green wrappers, printed in black, and trimmed flush with body of the book. 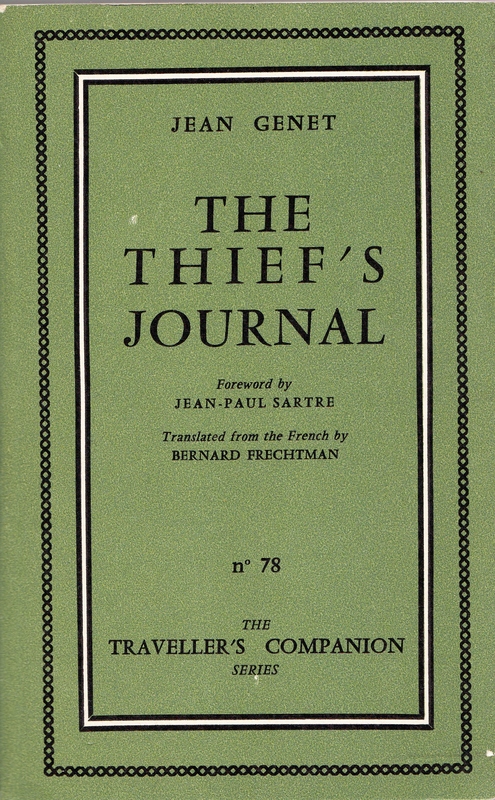 [Front cover; within a frame of two borders, the outer consisting of fine linked chain of type device in black, and the inner a thin band of white edged in black:] JEAN GENET | THE | THIEF’S | JOURNAL | no 78 |Foreword by | JEAN-PAUL SARTRE | Translated from the French by | BERNARD FRECHTMAN | THE | TRAVELLER’S COMPANION | SERIES’. [Spine; within a white, black-edged panel, the series no. in horizontal digits at bottom and title lettered vertically up spine:] 78 [-] THE THIEF‘S JOURNAL. [Back cover, at bottom right-hand corner:] 18 francs | NOT TO BE SOLD IN | THE U.S.A. OR U.K.